Dating websites often claim attraction between two people can be predicted from the right combination of traits and preferences, but a new study casts doubt on that assertion. 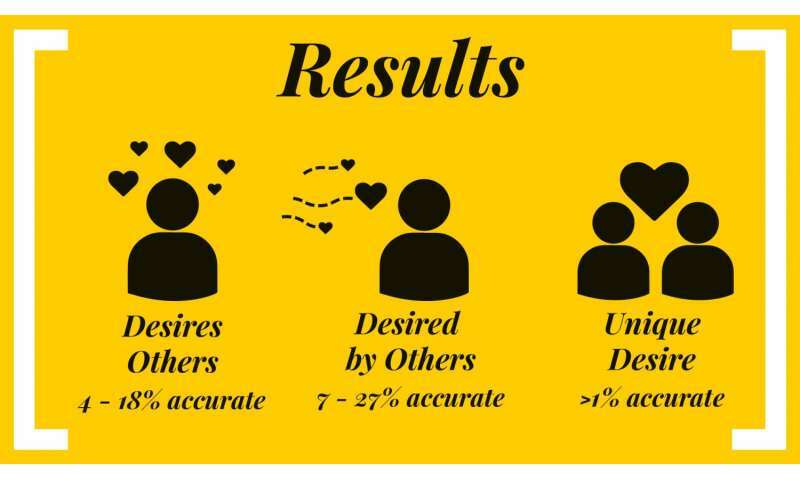 The study, which used speed dating data, found a computer could predict who is desirable and how much someone would desire others—who's hot and who's not—but it could not unravel the mystery of unique desire for a specific person. 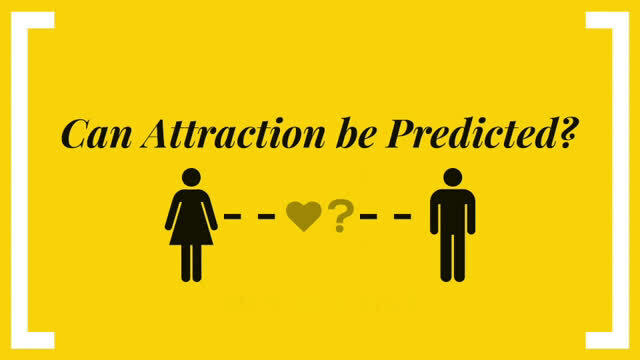 "Attraction for a particular person may be difficult or impossible to predict before two people have actually met," said Samantha Joel, a University of Utah psychology professor and lead author. "A relationship is more than the sum of its parts. There is a shared experience that happens when you meet someone that can't be predicted beforehand." The study, "Is Romantic Desire Predictable? Machine Learning Applied to Initial Romantic Attraction," was published today online by the journal Psychological Science. 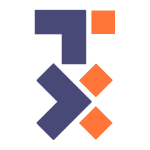 Co-authors on the paper are Paul W. Eastwick of the University of California, Davis, and Eli J. Finkel of the Kellogg School of Management at Northwestern University. Joel also will present the findings at TEDxSaltLakeCity on Sept. 9 at Kingsbury Hall on the University of Utah campus. The researchers used data from two samples of speed daters, who filled out questionnaires about more than 100 traits and preferences and then met in a series of four-minute dates. Afterward, the participants rated their interactions, indicating level of interest in and sexual attraction to each person they met. Joel and her colleagues used a cutting-edge machine learning algorithm to test whether it was possible to predict unique romantic desire based on participants' questionnaire responses and before the individuals met. The answer was no. They found it was possible to predict the overall tendency for someone to like and to be liked by others—but not which two particular people were a match. "We found we cannot anticipate how much individuals will uniquely desire each other in a speed-dating context with any meaningful level of accuracy," Joel said. "I thought that out of more than 100 predictors, we would be able to predict at least some portion of the variance. I didn't expect we would find zero." It would be great if people were able to circumvent the hassle and heartache of the dating process by entering information into a computer and having it produce the perfect soul mate, Joel said. "We tried to do it and we couldn't do it," Joel said. "Dating can be hard and anxiety provoking and there's a market there for a short cut. What if you didn't have to kiss all the frogs? What if you could skip to the part where you click with someone? But our data suggests that, at least with the tools we currently have available, there isn't an easy fix for finding love." While online dating sites provide a valuable service by narrowing the field and identifying potential romantic prospects, "they don't let you bypass the process of having to physically meet someone to find out how you feel about them," Joel said. The bottom line is relationship science still has a long way to go to decipher romantic attraction and what makes two particular people click, said co-author Eastwick. "It may be that we never figure it out, that it is a property we can never get at because it is simply not predictable," Eastwick said. "Romantic desire may well be more like an earthquake, involving a dynamic and chaos-like process, than a chemical reaction involving the right combination of traits and preferences." You say you don't care about dating a hottie?